One minute you think you must have been a naughty boy this year as yet another Leeds United defender hobbles off with a long term injury, and then you think Christmas has come early as the opposition goalkeeper gifts you three points in a big Yorkshire Derby against promotion rivals. The last few days have certainly put us through the rollercoaster of emotions that football can bring, and at this time of year, we’d quite like things to be a little more stable and predictable, so we can settle down and enjoy the upcoming festive period. But life as a Leeds United fan is never going to be like that. Barring a very dramatic capitulation in form, Leeds should see out the remainder of 2018 in the top six and be well placed to turn around in January and face the home straight with a clear view of what’s needed. Despite signs that the wheels might be falling of Marcelo Bielsa’s promotion wagon, Leeds have somehow kept it on course. In the face of dodgy form, horrific refereeing decisions and a frankly ridiculous injury situation, Leeds have chipped away at the division and maintained a top six spot, and they opened December with perhaps a season-defining win at Sheffield United that could really give the season the lift-off it needed. Every week and every game appears to be presenting new challenges at the moment, with every stone at Thorp Arch upturned to ensure anyone that has ever played in defence is made available. Three clean sheets from the three games played since the 4-1 trouncing at West Brom suggests that Leeds have been solid as a rock, but while there was little to fear in the two recent home games versus Bristol City and Reading, Saturday’s feisty encounter with Sheffield United was a different prospect altogether. November was navigated with almost a month between home games, and we had to wait until Saturday 24thfor the visit of Bristol City. At least it was a 3pm Kick-Off, although three days later we returned to the unaccommodating 7.45pm starts as Reading swiftly came to town in the pouring rain. Leeds had to win both games, and while never quite firing on all cylinders, they did so with relative ease. 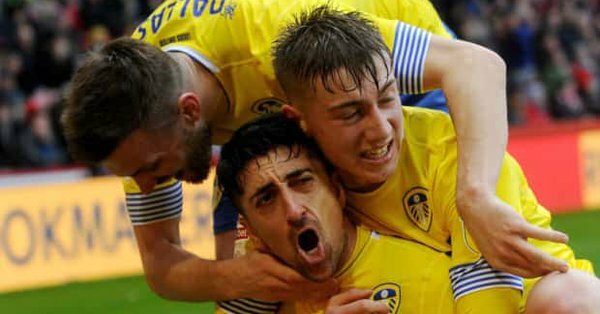 That made the 1-0 win at Bramall Lane something of an unexpected bonus, and certainly Pablo Hernandez gobbled up the generous gift he was presented with. It solidified Leeds’s position in second place, and offered a feint opportunity of opening up a gap over the rest of the play-off places before Christmas. In a sequence of three games, Leeds now face Queen’s Park Rangers at home, Bolton away and Aston Villa away. To close out the year we then face Hull City at home and Blackburn Rovers at home. On paper it certainly looks a quite obliging run of games, with only Villa away being one you wouldn’t automatically expect Leeds to win. But then having already won at Derby County, Norwich City and Sheffield United, there’s no reason to go to Villa Park feeling daunted. And suddenly from the depths of despair in the sorry aftermath of the chastening defeat at the Hawthorns, you have to believe that Leeds have a genuine claim on a top two spot. Nothing is certain in football, of course, and certainly not in the Championship. Optimism is not just based on Leeds somehow managing to deal with every form of upset, though, but also in the knowledge that key players such as Luke Ayling, Gaetano Berardi and Patrick Bamford are expected to return from injury, while Chelsea loanee Izzy Brown is expected to make his first appearance in a Leeds shirt in the run-up to Christmas. Barring any further injuries, that should put the Leeds squad back at full strength just at the right time, and while it guarantees nothing, it does make the recent passage of three consecutive wins all the more important. So in December we can look forward to three absolutely bumper home games at Elland Road. Two of these are Saturday 3pm Kick-Offs and the other is a Boxing Day 3pm Kick-Off. So the random fixture generator *sideways glance to camera* has been very kind in offering us Lancashire and Yorkshire Derbies versus Blackburn and Hull over Christmas, but before that we are expecting another 30,000-plus crowd for this weekend’s visit of Queen’s Park Rangers. You can be certain that we will be well prepared at the Old Peacock. The regular influx of huge crowds is nothing new to us and this time of year is when our matchday operation truly comes into its own. The pre-match atmosphere hardly needs cranking up, but the festive period certainly brings a bit more cheer, and if Leeds are still in the top two over Christmas, get ready for some pretty vintage occasions. This year is a little different for us at the Old Peacock, as our restaurant partnership with the Spiced Mango brings something new to Christmas. The guys have decided to open on Christmas Day and have put together a fantastic deal to tempt you out of the house after Santa has been. For just £29.95 you can have a starter, main, two side dishes, sundries and a dessert. For children under 10, the price is just £16.95. The restaurant is only open between 12 noon and 3pm, so book early to secure an alternative Christmas Day that ticks all the boxes. Until then, we look forward to welcoming you all to the pub in the run-up to Christmas, as the party season kicks off in earnest. We hope to see plenty of you for the Leeds United home games also, and of course we would like to wish all our customers and Leeds United fans everywhere a very Merry Christmas and a Happy New Year.